LEAMINGTON, ON, Feb. 6, 2019 /PRNewswire/ – Aphria Inc. (“Aphria” or the “Company“) (TSX: APHAandNYSE: APHA) today announced that its Board of Directors (the “Board“) has rejected the hostile bid by Green Growth Brands Inc. (CSE:GGB) (“GGB“) to acquire all of the outstanding common shares of the Company (“Common Shares“) including any Common Shares that may become issued and outstanding after January 22, 2019, but prior to the expiry of the hostile bid upon the exercise, conversion or exchange of options, warrants, debentures or other securities of the Company exercisable or convertible into Common Shares, other than Common Shares owned by GGB or its affiliates, in exchange for 1.5714 shares of GGB (the “Hostile Bid“). Based on the 20-day volume-weighted average price of GGB shares immediately before GGB’s announcement of an intention to acquire the Common Shares of the Company, the Hostile Bid reflects a 23% discount to the Company’s share price over the same period. The Board made its recommendation after careful consideration and receipt of the recommendation of a committee of its independent directors (the “Independent Committee“), who were advised by financial and legal advisors. Does not account for Aphria’s bright outlook, either as an independent company or in partnership with a strategic partner, which offers Aphria shareholders substantial value creation. Simon continued, “Today, Aphria is in a better position than ever to create long-term value for our shareholders, following a positive second quarter and continued progress expanding our production capacity and global footprint. Over the past five years, we have built a strong foundation for a leading global cannabis company in cultivation, manufacturing, research and distribution infrastructure, as well as forging strategic investments and alliances to efficiently scale around the world. GGB is offering Aphria shareholders a 23% discount on their investment in Aphria, relative to Aphria’s volume-weighted average share price over the twenty days prior to GGB’s initial public proposal and based on the price of GGB shares over the same period. Based on the closing price of $5.87 per GGB share on the CSE on February 4, 2019, the implied consideration under the Hostile Bid would be $9.22 per Aphria share, a 35% discount to Aphria’s closing price on the TSX of $14.21 per share on the same day. This is in sharp contrast to the median 46% premium in recent takeover transactions1 involving other Canadian licensed cannabis producers. The timing of GGB’s Hostile Bid is highly opportunistic, timed to exploit uncertainty about the Special Committee process and recent executive changes; to pre-empt Aphria’s ability to generate material free cash flow once operations are fully licenced and operating at capacity; and to deny Aphria shareholders the opportunity to fully realize the value of its recent international expansion. A combination of GGB and Aphria would have negative repercussions, including delisting from the TSX and NYSE, that could destroy value for Aphria shareholders, with minimal offsetting operational, financial or strategic benefits, given that GGB’s U.S. cannabis activities are illegal under U.S. federal law. This may reduce Aphria’s strategic options and access to capital, since certain investors may be unable or unwilling to hold shares in a CSE-listed company or in a company with U.S.-based cannabis assets. Delisting from the TSX and NYSE will also substantially reduce liquidity for Aphria shareholders, reduce their ability to leverage their shares and potentially reduce interest from strategic partners. Aphria shareholders would be giving GGB shareholders a 36% interest in Aphria, as well as control of management and the board, in exchange for shares in a company with limited operations. GGB’s ownership of the combined company would be vastly out of proportion to their contribution to it, by any relevant measure of value including revenue, production infrastructure or volumes, assets, relevant expertise and licenses. There are no material synergies that can be realized by combining GGB and Aphria, given the minimal geographic and operating overlap. GGB’s nascent U.S. retail concept and management team, with limited experience in cannabis or knowledge of regulated industries, would contribute little to Aphria’s established Canadian and international medical and adult-use cannabis operations. In addition, U.S. federal law would preclude Aphria from shipping its product, including raw materials or ingredients, to the U.S. There is no guarantee that GGB will be able to complete its proposed $300M financing, in whole or in part. Accordingly, there is no guarantee that GGB will be able to fund the capital requirements of the combined company. In contrast, if completed, GGB’s proposed $300M financing deal would further dilute Aphria shareholders including for the benefit of GGB insiders, if the backstop commitment detailed in the bid is required. 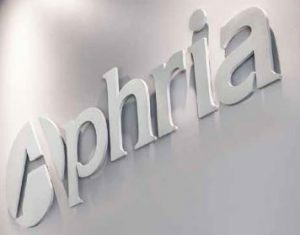 Aphria’s bright outlook, either as an independent company or in partnership with a strategic partner, offers Aphria shareholders substantial potential value creation. Over the past five years, Aphria has built a strong foundation for a leading global cannabis company in cultivation, manufacturing, research and distribution infrastructure, and has invested in key strategic partnerships and alliances to efficiently scale around the world. Aphria is successfully executing on its strategic plan. Recent milestones include strong quarter-over-quarter growth, as reflected in the most recent quarter’s results, and the completion of Phase IV and Phase V expansions of Aphria One and completed retrofit of Aphria Diamond, both of which have currently pending applications before Health Canada, which will increase Aphria’s production capacity to 255,000 kilograms per year. Aphria’s has multiple options to create substantial near-term value as an independent company, including by expanding in the medical-use market in Europe, Latin America and the Caribbean; gaining market share in the adult-use market in Canada; pursuing options in the U.S. once adult- and/or medical-use cannabis is federally legalized; and developing products for the burgeoning cannabis health and wellness sector. If you have already tendered your Common Shares to the Hostile Bid, you can withdraw your Common Shares by contacting your broker or Laurel Hill Advisory Group, Aphria’s shareholder communications advisor and information agent at 1-877-452-7184 (toll-free for shareholders in North America) or 1-416-304-0211 (collect call for Aphria Shareholders outside North America) or via email at assistance@laurelhill.com. Legal counsel to Aphria’s Board and Independent Committee is Fasken Martineau DuMoulin LLP and Scotiabank has been retained as financial advisor. Gagnier Communications is serving as strategic communications advisor and Laurel Hill is acting as Aphria’s shareholder communications advisor and information agent. Aphria is a leading global cannabis company driven by an unrelenting commitment to our people, product quality and innovation. Headquartered in Leamington, Ontario – the greenhouse capital of Canada – Aphria has been setting the standard for the low-cost production of safe, clean and pure pharmaceutical-grade cannabis at scale, grown in the most natural conditions possible. Focusing on untapped opportunities and backed by the latest technologies, Aphria is committed to bringing breakthrough innovation to the global cannabis market. The Company’s portfolio of brands is grounded in expertly-researched consumer insights designed to meet the needs of every consumer segment. Rooted in our founders’ multi-generational expertise in commercial agriculture, Aphria drives sustainable long-term shareholder value through a diversified approach to innovation, strategic partnerships and global expansion, with a presence in more than 10 countries across 5 continents. CAUTIONARY NOTE REGARDING FORWARD-LOOKING STATEMENTS: Certain information in this news release constitutes forward-looking statements under applicable securities laws. Any statements that are contained in this news release that are not statements of historical fact may be deemed to be forward-looking statements. Forward looking statements are often identified by terms such as “may”, “will”, “would”, “should”, “could”, “expects”, “forecasted”, “exposed”, “unlocks” “plans”, “intends”, “trends”, “indicates”, “anticipates”, “believes”, “estimates”, “predicts”, “likely” or “potential” or the negative or other variations of these words or other comparable words or phrases, although not all forward-looking statements contain these words. Forward-looking statements in this news release include, but are not limited to, statements with respect to expectations regarding Aphria’s prospects for growth and expansion plans at its facilities and the capacity thereof, advancement of international projects, the performance of Aphria’s business and operations, operational scope, operations, share price, the ability to realize expected value, market opportunities, accretion or synergies; shareholder value creation; statements regarding the execution of Aphria’s strategic plans; the near and long-term consequences of the Hostile Bid; and expectations regarding the cannabis industry in general. Forward-looking statements contained in this news release are based on a number of estimates and assumptions including, but not limited to, assumptions as to: competitive conditions in the cannabis industry; general economic conditions; and changes in laws, rules and regulations applicable to Aphria and its business, and there can be no assurance that such estimates and assumptions will prove to be correct. Forward-looking statements in this news release involve known and unknown risks and uncertainties, general and specific, and other factors that may cause, individually or in the aggregate, actual results and developments to be materially different from those expressed or implied by such forward-looking statements, including, but not limited to: the Hostile Bid; general operating challenges including general business, economic, financial market, political and regulatory conditions in regions in which Aphria operates and the completion of any capital project or expansions including the ability of Aphria to execute on long-term and short-term strategic priorities. For more detailed information, refer to the risks and uncertainties including risks in the cannabis industry identified in Aphria’s public disclosure including in its most recent interim filings and Annual Information Form dated July 31, 2018, filed with the applicable securities regulatory authorities in Canada, which are available under Aphria’s profile on SEDAR at www.sedar.com. The Company believes that the expectations reflected in the forward-looking statements contained in this news release are reasonable as at the date hereof, but no assurance can be given that these expectations will prove to be correct, as actual results and future events could materially differ from those anticipated in such statements. Except as required by law, the Company does not undertakes any obligation to update publicly or revise any forward-looking statements, whether as a result of new information, future events or otherwise. Forward-looking statements contained in this news release are expressly qualified by this cautionary statement.